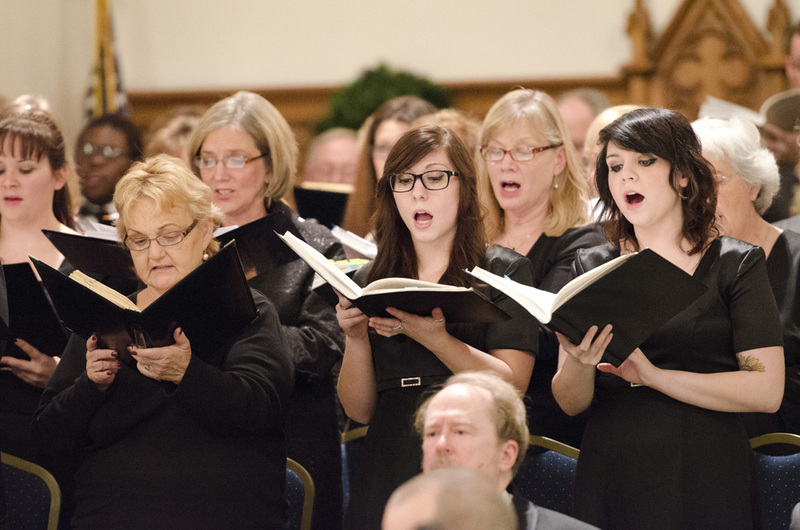 Kellogg Community College’s Branch County Community Chorus will bring the holiday spirit to Coldwater Dec. 7 with their annual Sounds of the Season concert. This year’s presentation – “Gloria” & Other Sacred Settings – will begin at 7:30 p.m. at St. Mark’s Episcopal Church, 27 E. Chicago St., Coldwater, and will feature more than 40 student and community singers; an instrumental ensemble including trumpets, trombones, percussion, a tuba and organ; and soprano soloist Betty Picard, a KCC faculty member. The concert is free, but a freewill offering will be taken to benefit future vocal arts initiatives at the College, including an international concert tour of Italy next summer. Dr. Gerald Blanchard, vocal music professor at KCC, said the presentation is a major fundraiser for the concert tour of Italy and will examine the various settings of the text “Gloria in excelsis deo” throughout nearly 700 years of musical history. The phrase – which means “Glory to God in the highest” – recalls the words sung by the angels that appeared to the shepherds in Luke’s biblical narrative of Jesus’ birth. Program selections featuring elements of the phrase date from the 1400s to the 21st century. The concert – sponsored in part by Randall Foods, Inc., and Eleanor R. and Robert A. DeVries – will run for about one hour, and a dessert reception will immediately follow the performance. For more information about this presentation or other vocal arts initiatives at KCC, contact the College’s Arts and Communication offices at 269-565-7859 or visit www.kellogg.edu/performart. Donations for the KCC choirs’ trip to Italy may be made online at www.gofundme.com/4py40c. For more news about KCC, view our latest press releases online at daily.kellogg.edu/category/press-releases.